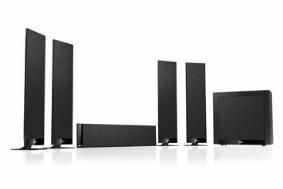 BRISTOL SHOW 2011: KEF expands T series with £1700 T305 system | What Hi-Fi? Selling for £1700, the T305 comprises two pairs of matching T301 tall speakers for front and rear duties, plus a T301c centre and T-2 subwoofer. The T Series incorporates a completely new ultra-low profile bass and midrange driver (11.5cm) alongside a large, fully vented new 25mm tweeter. The new drivers sit within 35mm deep cabinets that KEF claims will perform as strongly mounted on a wall as on the proprietary stands thanks to an innovative crossover design. The suspension and magnet system are moved to the side of the voice coil. KEF claims the design gives the performance of a conventional 7.5cm deep driver from a 27mm deep unit. The T305 joins the existing £1200 T101 model we've first tested in the March 2011 issue of What hi-Fi? Sound and Vision, on sale now. A £1500 T205 system is also planned.